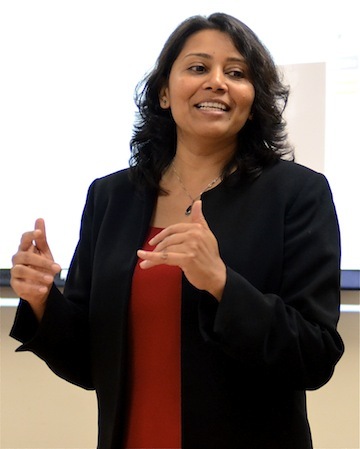 Swapna Kumar, a clinical assistant professor of educational technology at the College of Education, has added another published article to her CV — but this one comes with a bit of history. Kumar’s “Quality Considerations in the Design and Implementation of an Online Doctoral Program” appeared as the first of eight articles in the inaugural issue of the Journal of Online Doctoral Education, which went online in June. The biannual e-journal features outstanding scholarly contributions in online doctoral education from researchers around the world. “It’s a ‘Dos and Don’ts’ kind of an article about how to offer a quality online doctoral program,” said Kumar, who coordinates the online doctoral program in the COE’s educational technology program. “If it’s thoughtfully designed, online learning can make a huge difference in the lives of professional adults. Journal editor Gregory T. Bradley said Kumar and other leading online education scholars were invited to submit articles for the launch of the Summer 2014 edition. Kumar mentors graduate students and teaches courses on distance learning, blended learning, technology integration and educational technology research. Her article in the Journal of Online Doctoral Education can be found online at http://jode.ncu.edu. Source: Swapna Kumar; swapnakumar@coe.ufl.edu; 352-273-4175. Media Relations: Larry Lansford, director, College of Education Office of News and Communications; llansford@coe.ufl.edu; 352-273-4137. Writer: Stephen Kindland, College of Education Office of News and Communications; skindland@coe.ufl.edu; 352-273-3449.